The STR9's rear end is perhaps the first warning shot of just how complex we can expect the RB10 to look once it's actual specification is revealed either later in testing or in Melbourne. 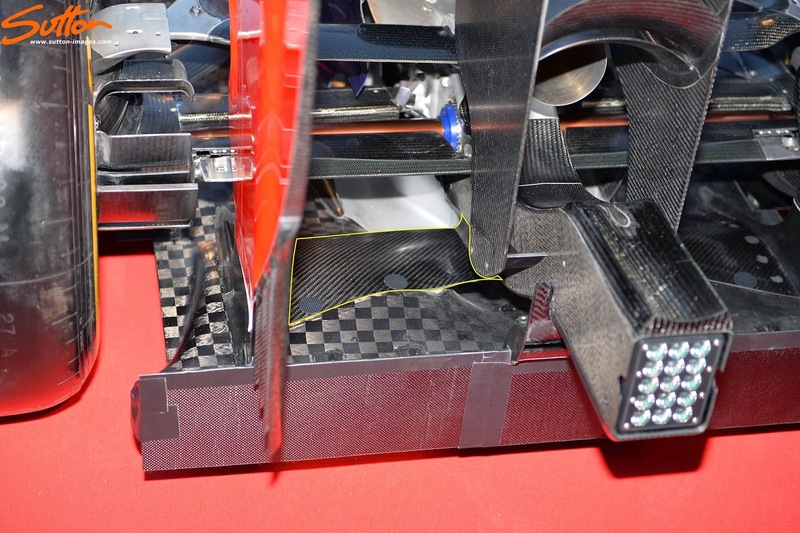 One of the nice features I noted at the car's launch is the use of a wing mounted on the reference plane. This wing not only adds structural integrity to the Rear Wing assembly but isolates the airflow in the central section of the car. For 2014 the crankshafts height from the reference plane has been increased by 32mm enabling more space for airflow to pass between the crash structure and the floor. Toro Rosso have also scalloped out the central section under the crash structure to utilise the wing and further increase the space between it and the crash structure. They aren't the only ones to be doing this with Mercedes, Ferrari, McLaren and Williams all following a similar design ethos. Further development is likely to take place on this element throughout the season as the team further open up the scalloping of the floor.